Published: Feb. 20, 2012 at 06:41 p.m.
Ryan Tannehill could be the third QB off the board in April, but a broken foot is limiting his pre-draft work. Before players at the NFL Scouting Combine talk to teams or step foot in Lucas Oil Stadium, they are subjected to various medical tests. Those with injury histories are heavily scrutinized in the areas where their maladies occurred. If these players aren't given high medical grades by team doctors -- all 32 franchises have their own physicians viewing the X-rays/MRIs -- then it severely cuts down their chances of being picked where their pure football value would predict they land. Additionally, teams pay particular attention to players with on-field and off-field character concerns. Teams are allowed to conduct 15-minute, private interviews with up to 60 of the 328 players invited to the combine. Omar Bolden, CB, Arizona State: This talented cover corner tore his left anterior cruciate ligament in spring practice, but did not play at all in 2011. Ryan Broyles, WR, Oklahoma: The NCAA's all-time receptions leader tore his left ACL vs. Texas A&M in November. Josh Chapman, DT, Alabama: Chapman played through a torn left ACL/meniscus to help Alabama win the BCS title after suffering the injury on Oct. 1 vs. Florida. But he was forced to sit out the Senior Bowl to have surgery. Greg Childs, WR, Arkansas: Childs' junior season ended prematurely due to a torn right patella tendon. He started 2011 slow while recovering from the injury, but came on later in the year. Aaron Corp, QB, Richmond/USC: A cracked left fibula in 2009 cost Corp the starting job at USC, then he suffered a season-ending right knee injury in 2010. He served as a full-time starter in 2011, but teams still want to see if his legs are fully healed. Jared Crick, DE/DT, Nebraska: A torn pectoral muscle on Sept. 17 cost him the chance to have a second strong season inside without Ndamukong Suh being double-teamed beside him. Andrew Datko, OT, Florida State: The Seminoles' left tackle had surgeries on both shoulders before 2011, but they "didn't take," according to head coach Jimbo Fisher. Datko started the first four games before sitting out the rest of the season. Patrick Edwards, WR, Houston: Edwards ran into a cart behind the end zone during an Oct. 2008 game at Marshall, suffering a gruesome compound fracture of his right shin. He looks fine now, but teams will still need their doctors' approval to draft him before the sixth or seventh round. Cyrus Gray, RB, Texas A&M: The Aggies running back sustained a stress fracture in his left shoulder vs. Kansas in November, but still managed to eclipse 1,000 yards for a second consecutive season. Gray missed the Meineke Car Care Bowl due to the injury. Jonas Gray, RB, Notre Dame: Gray was coming into his own before a torn right ACL vs. Boston College forced him to miss the season's final two games. Coryell Judie, CB, Texas A&M: Scouts have serious concerns about Judie's durability after he missed six games during 2011 season with a nagging pulled hamstring. Peter Konz, C, Wisconsin: Konz is likely to be the top center drafted, but he was diagnosed with blood clots in his lungs in 2009 and then suffered a dislocated left knee in 2011 (though he returned to start the Rose Bowl). Chase Minnifield, CB, Virginia: The next Virginia cornerback likely to be a top-40 pick (following Chris Cook and Ras-I Dowling in the last two years) did not play against Auburn in Chick-fil-A Bowl after suffering a knee injury in practice. Lucas Nix, OG, Pittsburgh: Nix missed five midseason games this fall with a left knee injury, though he did start the final two regular season games and BBVA Compass Bowl loss to SMU. Josh Oglesby, OT, Wisconsin: The 6-foot-7, 330-pounder started 13 of the team's 14 games in 2011, but he has had multiple surgeries on both knees, starting his senior year of high school. Chris Owusu, WR, Stanford: The Cardinal wideout suffered three concussions in 13 months, missed three games in 2011 and only played on the final snap of regular season finale against Notre Dame as a nod to his career. Chris Polk, RB, Washington: Surgeries on his right shoulder early in his career didn't prevent him from carrying the ball 553 times the past two seasons, but teams will still want it checked out. James Rodgers, WR, Oregon State: A left knee injury ended Rodgers' 2010 season prematurely and forced him to have two surgeries. He also missed the first two games of 2011 due to the injury. 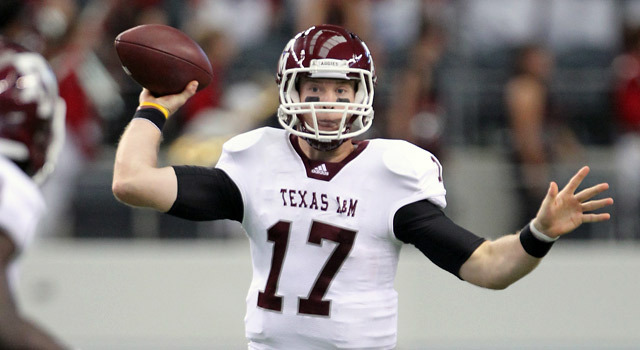 Ryan Tannehill, QB, Texas A&M: Tannehill missed the Senior Bowl after suffering broken foot (fifth metatarsal) in a passing drill following his senior season. He'll need some sort of pre-draft workout -- likely on campus later in the process -- so teams can decide whether he fits the bill as the third-best quarterback in the draft. Nick Toon, WR, Wisconsin: The son of former NFL receiver Al Toon missed 2011 spring practices with a stress fracture in his left foot. He played through the troubling injury as a senior, but did not participate in the Senior Bowl after breaking scar tissue. Fozzy Whittaker, RB, Texas: The heart and soul of Texas' offense tore the ACL and MCL in his right knee at Missouri, missing the last month of the season. Jordan White, WR, Western Michigan: The sixth-year senior -- who "earned" a his final year of eligibility by missing two seasons (2006, 2008) with injuries in both knees -- led the nation in receptions and receiving yards in 2011. Vontaze Burfict, ILB, Arizona State: Burfict's an absolute missile when he's able to line up a ball carrier on the field, but some bad tape, a slew of personal fouls and a few trips to the bench provided by former Arizona State coach Dennis Erickson will have teams trying to figure out if Burfict has the maturity and/or intelligence to handle life in professional football. Michael Floyd, WR, Notre Dame: League officials already know about Floyd's three alcohol-related incidents (two at home in Minnesota, one in South Bend) during his collegiate career, but scouts may really be wondering why the immensely talented wideout chose not to compete at the Senior Bowl. Cliff Harris, CB, Oregon: Harris' final season at Oregon was marred by off-the-field issues. He was suspended for the final five games of the regular season and the Pac-12 title game after multiple traffic violations, and then ultimately dismissed from the team in December for violating team rules. Janoris Jenkins, CB, North Alabama/Florida: Multiple arrests for marijuana possession and the resulting transfer from Florida (where he was an All-SEC corner) to Division II North Alabama will need to be addressed. Marc Tyler, RB, USC: Son of former NFL RB Wendell Tyler has had multiple injuries, publicized off-field issues and reportedly came to spring practice overweight in 2010 and 2011.